At Airside Andy we are all about providing kids with fun and entertaining experiences, within a safe online environment. Airside Andy does not require any upload of personal data to be displayed or exchanged, making it incredibly safe and giving you peace of mind. By playing games and exploring the virtual airport you earn coins which can be redeemed in the airport shops for awesome costumes with unique power to enhance your avatar wardrobe! 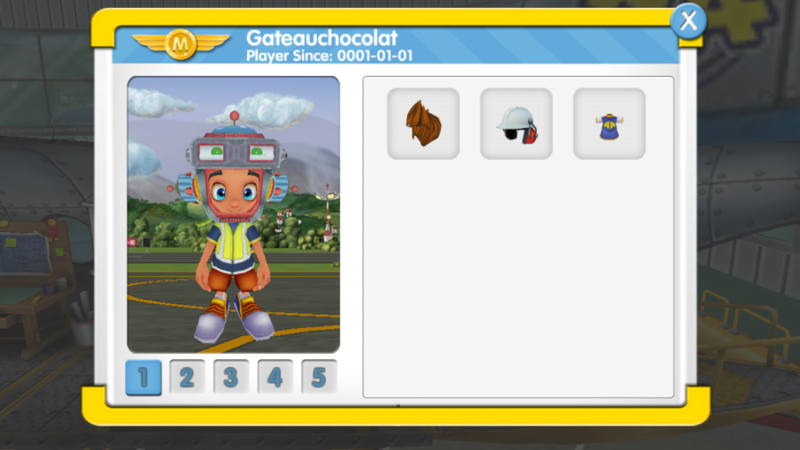 As a new player you get 150 coins to help start the creation of your avatar and help explore your favourite airport. Gameplay can enhanced with membership (details here) but is not a pre-requisite to joining the game. 1. What is Airport Andy? 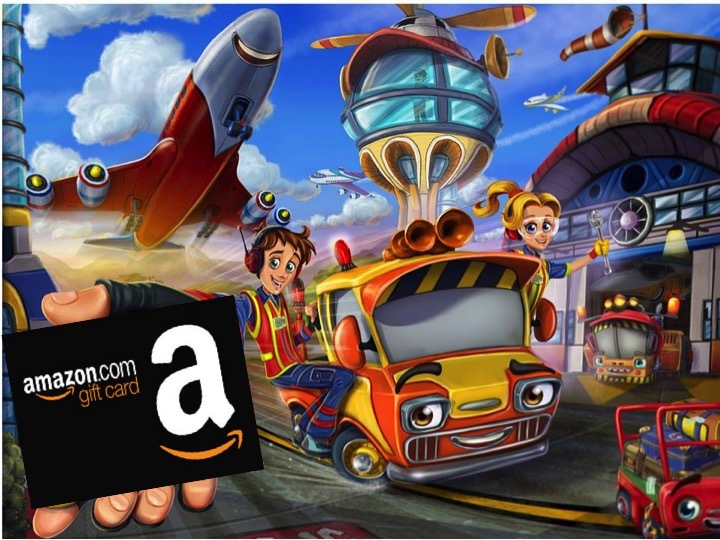 Airport Andy is a virtual world where you are invited to join the fun with the characters Andy and Tilly, and the wacky airport vehicles which work together to get the planes off on time. Create an avatar and dress him or her up like a robot. Fly with a superhero costume, play fun games and explore the behind-the-scenes airport locations. Playing games and working to keep the airport clean and tidy will earn you rewards in the form of coins that you can trade to get cool outfits and accessories. 2. Do children need to register to play Airside Andy? Children will need to create a username and register a parent’s email in order to play. Username will not be displayed until parent has approved the account within 10 days. 3. How do I play Airside Andy? In the airport there’s so much you can do! Once you’ve created your avatar, you can go exploring! The airport is a beautiful and magical place so explore the locations like the Control Room and the Airfield; and keep your eyes peeled for jobs that need doing like unloading cargo and picking up litter! You can keep count of your coins by looking at the number displayed on the top-right of the screen. 4. How do I earn coins? You get consumable and clothing in Airside Andy using coins. 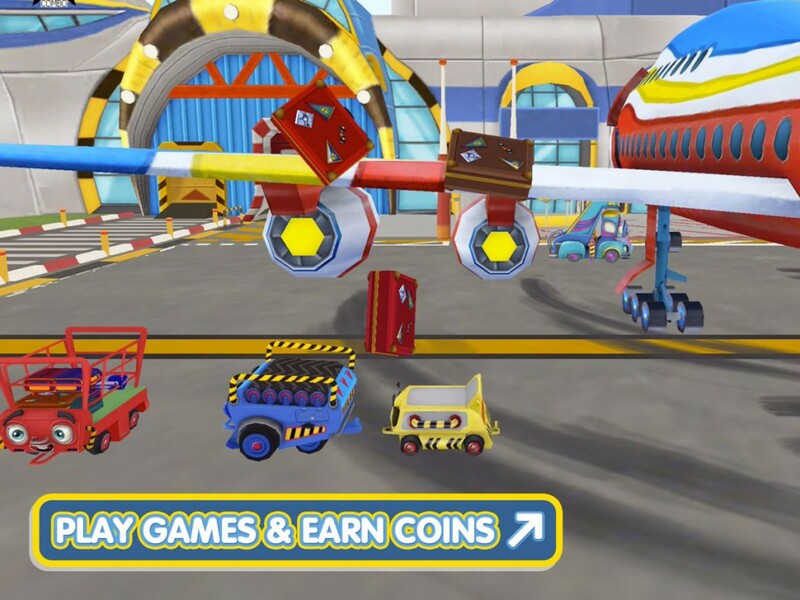 To earn coins, play the games in the airport and keep the airport tidy as you explore. It is easy to remember: the more you play the more you coins you get for your avatar. 5. What are the system requirements? You’ll need an Android or iOS device to play Airside Andy. Easy peasy! While we do our best to make all our online experiences as safe as possible, we encourage all parents and guardians to talk to their children about online safety. Subscribe to the new Airside Andy YouTube channel, where you can see exclusive trailers, reviews and game play on the move. By subscribing to our channel you can be the first to watch all the great Airside Andy videos available on YouTube. Amazon has a new plan to get their deliveries in time to their customers…and they made need Andy’s help! According to Reuters, Amazon has signed a deal to lease 20 Boeing 767 cargo planes from Air Transport Services Group. Pretty cool! Cargo planes have no passenger seats and, instead, only carry goods, or cargo. You can ship just about anything by cargo plane. Letters, packages, cars, horses, construction equipment and even other airplanes can be shipped air freight. The first 767 flew Sept. 26, 1981, 65 years after the first flight of William Boeing’s first airplane — the B&W — in June 1916. The paint used on a typical 767 weighs 400 pounds. The basic 767, at a maximum gross weight of 300,000 pounds, can take off on only 5,700 feet of runway. The 767 has approximately 3,140,000 parts. The 767 is capable of cruising at altitudes of up to 43,000 feet. The 767 flies automatically, from takeoff climb through landing, with the help of 140 microprocessors and computers. The sound of a 767 taking off from a 1.5-mile (3,000-m) runway is about the same as the average street corner traffic noise. At the moment, Amazon relies on the cargo planes of different companies such as UPS and FedEx to ship goods across the world. Having its own planes means Amazon won’t have to rely on couriers as much to get packages delivered to their customers. This could be especially helpful during the holidays, when many delivery systems are unable to keep up with the demand for presents! This week Airside Andy is running a competition to win a £20 Amazon voucher. To enter visit us on Facebook. UK only. Entries close midnight 18th March 2016. Every good party starts with a theme, and airplanes and airports great themes! Airplanes can represent awesome fun, adventure and excitement so it’s no wonder that they’re popular choices for kids’ parties. From vintage boeings with ordnance maps for an old-fashioned feel to modern crisp, white paper airplanes like the kind the cheeky Airside Andy avatars throw around the airfield sometimes, there are a variety of ways you can build an entire party out of these aircrafts and little vehicles. We are ready for take-off so please find your seat and fly the friendly skies in search of your next perfect party idea you can use to plan the perfect airplane party! A good plan is the key to success; it’ll ensure that every “i” is dotted and every “t” is crossed as you run through your party checklist, from budgets and number of invitations to colour themes and games, so you can relax and enjoy the party as much as the kids. Don’t go into party planning blind though; with a wealth of ideas to be explored within the game and on photo sharing sites such as Pinterest, Flickr and Instagram you’re sure to find plenty of ideas and inspiration on how to assemble your airplane party, so you don’t miss a thing! From boarding passes to luggage tags, to paper airplanes, there are a huge variety of creative options when it comes to creating your party invitations. An option for your little Airside Andy fans is to create lanyards, like those seen in the game! Just be sure that if you’re attaching a string to the lanyard, it has a safety clasp on it. Your party theme can encompass any aspect of air travel – whether that means creating an airport or airside setting or one that mimics being high in the sky. You can have guests check-in their luggage (gifts) at the door and suspend paper airplanes and white balloon clouds from the ceiling for an authentic flying experience. You can also use your airplane theme to control the flow of the party, cordoning off different areas of the room – into areas such as workshop, or airfield to take party guests from the face painting corner to the party games corner, for example. The star of the party, besides the guest of honour of course, is the birthday cake. It is the centrepiece of the table, and you can really make it shine amongst the laid out ‘pre-flight food and beverages’. Perhaps it will be a Jetstar cake! From airplane cake toppers to custom cakes to cookies shaped like mini jumbo jets, the possibilities are endless. Every party needs some games, and an airplane party is no exception. You can customise old favourites like ‘pin the tail on the donkey’ by playing games like ‘pin the propeller on the airplane’ or ‘pass the parcel’ becomes ‘the luggage game’ and musical chairs has an airplane music playlist. Or you can have the kids make and decorate their own paper airplanes to take home! 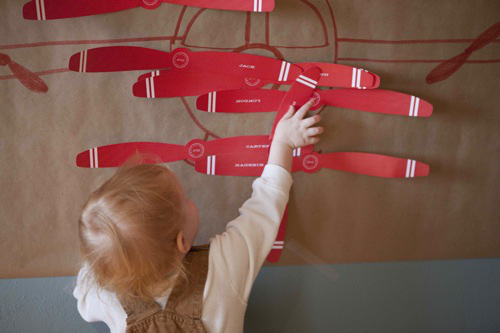 Every child loves a party bag to go home with, and they can form a part of your airplane theme too! Send the children to ‘baggage claim’ for their goodie bag (or box for a ‘luggage’ feel) and fill it with airplane cake and airport goodies! When the party’s ended and the paper plates have been put away, it’s time to wind down. If the kids aren’t already fast asleep after all the airport fun and helping Mummy and Daddy clean up, why not finish the evening with a game of Airside Andy, where children also learn to keep the airport nice and tidy. Phew! Kids are fascinated by airplanes, but where do planes live, airports! And airports are even more intriguing for kids. Planes come in all shapes and sizes: from airbuses, jumbo jets and huge cargo planes to jet planes and two seater propeller planes. When kids see a plane they yell, ‘plane’. Even small planes are big and make lots of noise, they go really fast, they often have names and are brightly coloured, what is not to like about such machines. Adults look wistfully as planes cross the sky where kids look upon them with a sense of wonderment and a youthful desire for travel and adventure. Place these machines within their home environment, namely an airport, and you have an adventure wonderland for kids. Mix in the crazy looking vehicles that whizz around the planes, such as baggage carts, push back trucks, catering trucks and fuel trucks all loading and unloading and you have an environment that screams come and play. Letting kids onto the runway to play with the nice aeroplanes is of course very dangerous and frowned upon at all airports. But playing with toy airplanes and airport vehicles gives a child a sense of being on the other side of the glass, a place where they are not allowed to go, an adult world of big noisy, fast machines that take people to exotic lands. Let’s face it, airports and planes are just down right exciting! And if you are thinking this is all boys own stuff, planes and vehicles are just as fascinating for girls. In the video below, two sisters have looking at the planes and airport vehicles in Airside Andy. Lovely to see Airside Andy being played in the airport and on the airplane. For the full review visit All Baby Advice. Happy travelling! Airside Andy Celebrates Launch with Prizes! Our highly interactive game has been designed in partnership with Technicolor and Flying Squirrel Games (ex Club Penguin and Dragonvale). This is a world first, the very first 3D virtual world for kids which has been designed specifically for smart phones and tablets. If you look at other MMOs in this space, such as Club Penguin and Moshi Monsters, they were designed and built originally for PCs then developed into apps. As a result, certain aspects of game play are not wholly suited to the app environment. We focused solely on the mobile and tablet which has allowed us to get it right, right from the start. Simple functionality, such as interconnecting play areas means users can walk around as if they are truly within the busy space of a working airport. Together with stunning graphics we are offering kids an open-ended game-play within the fascinating airport environment. Today’s update includes a brand new robot costume so please take the time to check it out! To celebrate our special launch – our “birthday” – so to speak, we’ll be spending the whole of March giving away children’s goodies in weekly competitions through our social media channels – both Twitter and Facebook. For your chance to win, just follow the instructions on screen. Good luck! Staring out of the window onto the runway at the airport, watching all the crazy looking vehicles unload and load planes, but have you ever thought just how busy it is and what goes on behind the scenes. 1. Heathrow airport sells more than 26,000 cups of tea, 35,000 cups of coffee and 1,050 bottles of champagne every day!! More than 974 tons of chips are sold at the airport every year (source Heathrow airport). 2. Breakfast is the most popular meal of the day at Heathrow with almost five million eggs, 6.4million croissants and 4.5million rashers of bacon served every year. The number of pastries sold annually would line a runway in both directions 350 times. 3. Heathrow Terminal 5 has 30 miles of baggage conveyors, 2.8 miles of tunnels and 44 baggage reclaim belts. Around 53 million pieces of luggage are processed every year. 4. In any one day there are approximately 100,000 flights worldwide carrying around 8 million people. In 2014 3.3 billion people travelled by plane, which is around 44% of the world’s population (source IATA). Every day at Heathrow 1,400 flights take off and land – one every 45 seconds. 5. It takes under two hours to prepare a Boeing 777 with 66 tons of fuel, five tons of catering supplies, 3.6 tons of luggage and 23 tons of mail and cargo. 6. The air traffic control tower at Thailand’s New Bangkok International Airport is 434 feet and is the tallest air traffic control tower in the world. 7. Singapore’s Changi Airport has a nature trail and a butterfly garden with over 1000 butterflies. 9. The white lines in the sky left behind a plane are made of water vapour. You can guess the weather by looking at these. A thin, short lasting line indicates fair weather. A thicker longer line could be early signs of a storm. 10. This is not a fact or a stat, but a lovely quote from an airport photographer who said air traffic control towers are the choreographers of the airport, conducting the complex dance of the airport. With #Betaparents trending on Twitter yesterday, but in a digital context and not the “drawing battle-lines against alpha mums context” where I first came to hear the term, I figured there’s no better time to talk about what being a “Beta parent” means to ol’ me. The definition of Beta parent has evolved from being a term used to describe the ‘alternative’ (for want of a better word) parent who aims to harness and nurture their child’s creativity to the Beta parent who only wants to keep their children inside, permanently affixed to a computer screen, to being completely redefined this week by Norton as the term to used describe all of us – as the first generation of parents raising children in an all-encompassing digital world. I’m not sure if Norton’s promotional campaign to get #betaparents trending has had quite the effect they had hoped for, with its pun being used to condemn parents for not teaching children the value of outdoor play (unfair, but das ist the beauty of Twitter). I don’t see the correlation myself; why it has to be one or the other? Digital can surely serve to supplement children’s understanding of the outside world and to nature and the world through a child’s eyes. The beta parent knows that technology doesn’t have to distract from learning, that it can in fact enhance learning. There’s no escaping tech: in this world of few certainties (queue the old adage of ‘death and taxes’) there is certainty that technology is here to stay and to ever-evolve, and it will be this generation of children who shape tomorrow’s digital world. There just has to be a balance – most parents get that and the vast majority of kids use tech AND play outside(!) – the Twittersphere isn’t giving folks enough credit under the hastag #betaparents! Of course, the digital spaces we expose our children to have to be safe, and this can be worrisome, even to the most tech-savvy of us all. There’s a wealth of information on protecting your children online (my recommendations include Common Sense Media and Childnet which have become Bibles for me as Airside Andy launches into digital space) and on our own website we’re starting to build on our tips to make children’s online experiences within the MMO (Massively Multiplayer Online) arena as safe as possible. This is still a work-in-progress and as the game develops we’re offering parents (I’ve stopped saying #betaparents as 200 words into this blog-post I concluded that the term is EXHAUSTING and just too annoying!) the chance to test the game, along with their children and see how the safety features (as well as the educational and fun features!) on an MMO should work from the ground up. It’s Beta game testing, but with a difference. The usual beta test objective is to assess the current product quality, software support and market readiness. Basically, de-bug it! Of course, this forms part of our program but we’re actually hoping for a lot more. We’d like to improve on the quality of the Airside Andy game during the beta testing, according to WHAT PARENTS WANT and CHILDREN LIKE. 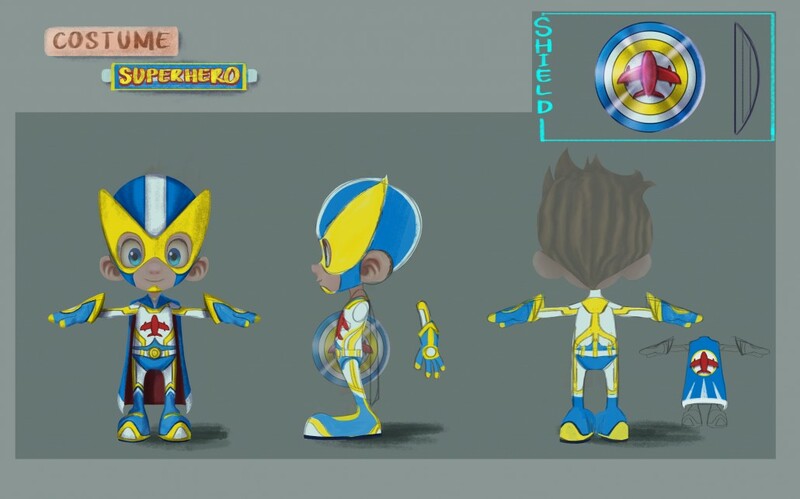 Our sketched ideas for Beta testers – make them all superheroes! We’re not taking, ‘we think we got it right’ for granted and we’ll be looking for feedback to help mould the game. This is extremely exciting for us! I mean, everything from music to voice-overs, to safety features, to avatar names and game-play, will ultimately be decided by our testers. Current safety features include parent log-in facility for access, exclusively pre-typed chat for safe social and a completely ad-free environment. We hope that by giving our testers unique insights to the game, not only will we be ensuring that we launch the best kids MMO in the world, but we’ll also be providing identifiers to help parents safeguard children across other apps and digital platforms. If you’re interested in this unique opportunity you can email me direct at danni@airsideandy.com and I’ll fly you over some information. Airside Andy’s world delivers when it comes to kids online safety. Our aim from the very beginning has always been to create a brand that children adore and mums and dads trust. As the brand has developed from book, to show, to app, the core mission has remained the same: fun, safe learning. Digital Learning! We create a world where digital gaming enhances our kids’ learning, rather than distracts from it. SEL Social and emotional learning provides the building blocks to a well-rounded, happy child. It’s why our games incorporate team-work and group goals on a social platform. STEM It’s never too early to expose children to activities that aim to enhance analytical skills and problem solving in a blended learning environment that encompasses all the STEM subjects – Science, Technology, Engineering and Maths. We’ve built STEM-focus into Airside Andy’s world. Family! Airside Andy is a world made for sharing, allowing children and parents to play together. Safety! We have created an app that covers kids online safety at every step. To give you a lowdown on some of the safety features, here’s a set of frequently asked questions, plenty more of which can be found in the “Parents” section of the website. For updated information on Airside Andy please sign up to the parents newsletter. Personal Information: Is AA collecting, transmitting or accessing personal information from the user to someplace outside of Airside Andy? User information stored locally on the app is solely stored by Airside Andy and its server solution Playfab. We do not store any information that can identify a child – no names, no address or anything like that. We receive as little information as possible, namely the avatar name, a password and a parent’s email, for the purpose of password retrieval and VPA (verifiable parents approval). This information is not shared with any outside parties. Purchasing: Can my child make additional purchases within the app, after downloading it from the app store? Yes, but not without parent permission. Permission takes the form of an Apple or Google password entered by the parent. Purchases and payments cannot be made without this password. Social Media and Plug-ins: Does AA include any integration with social media sites like FB or any other online service? No! Our audience is too young to legally be on Facebook 🙂 We would never encourage with type of integration with the children’s app. Internet: Does AA have links to the internet or app stores? In other words, will links in the app take my child outside of the app and into other online spaces? Advertising: Does AA app include advertising networks? App performance Reports: Does Airside Andy app generate anonymous usage reports? Yes, Airside Andy operates analytics software to report usage and errors in order to improve the app’s performance. This anonymous data is stored for the purpose of improving our product only. This data does not contain anything identifiable like birth-dates of locations, for example. The information is held within Airside Andy and its server solution Playfab only; it is never sold or distributed outside of our group. How Can I stay informed about the latest changes to online privacy? As it works to constantly uphold those regulations as set by the Children’s Online Privacy Protection Act (COPPA), parents can stay informed about the latest changes to kids online safety by signing up to our newsletter. There’s a lot of work involved in creating a great airport like Airside Andy’s Intercity Airport! From checking-in the passengers to loading the planes, it takes a big team and a lot of crew scamps. Here to prove it is a short film from Airside Andy’s friends at Newcastle Airport where, from dusk till dawn you can watch the hustle and bustle of the Newcastle International Airport, United Kingdom, in this awesome time-lapse video. Time-lapse videos show us very quickly what normally happens slowly over a long period of time. In this video we can see a whole day and night in the airport, all rolled into a hyper-speed 3.5 minute video. Here you can see airplanes as they make their journeys off the runway, you can see the baggage carts, the landing of planes and the many people it takes to help the planes get ready for takeoff. That’s why Airside Andy is so lucky to have lots of crew scamps working at his Intercity Airport! Take a look at the video and tell us what you can see! Can you see the Control Tower? How about the Workshop and the Airfield? How many airplanes can you see? 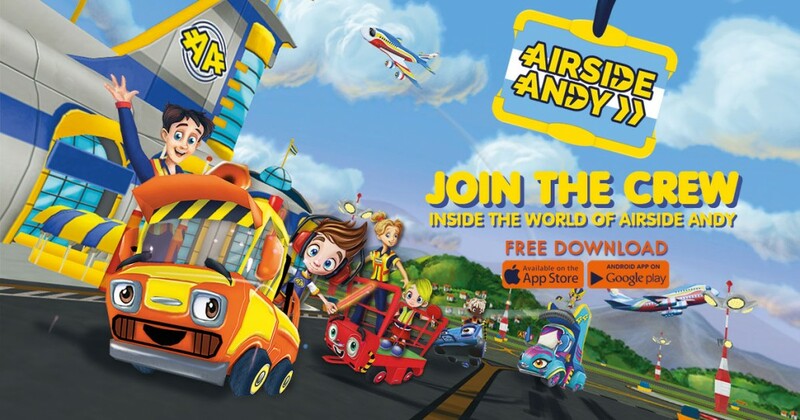 Airside Andy’s World launches in November but we would love for you and your children to get involved in trialling the game, with free install, free membership and free currency. Please register your interest, either by signing up to the newsletter or by email at info@airsideandy.com. Find out more about the North East of England’s largest airport at newcastleairport.com, or go to jackfisher.org to see more of Jack’s work.